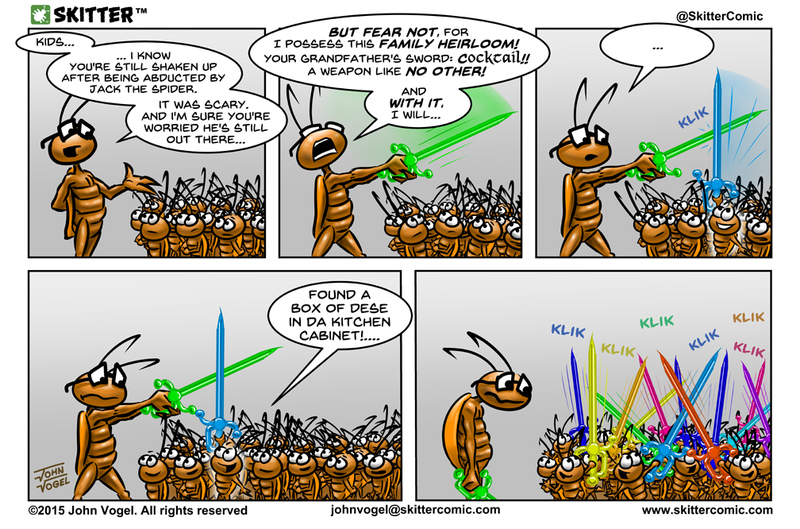 So far, this is my favorite Skitter comic strip. I’m not sure why. It just makes me laugh. Wednesday I publicly announced the latest work in progress video for the “Baseball” strip. Hope you all liked it! There’s been a nice spike in retweets and sharing on social media this past couple weeks. Thanks! I really appreciate it! MARTIN: "Kids... I know you're still shaken up after being abducted by Jack the spider. It was scary. And I'm sure you're worried he's still out there... BUT FEAR NOT, for I possess this family heirloom! Your grandfather's sword: COCKTAIL!! A weapon like NO OTHER! And WITH IT I will..."
DAVEY: "Found a box of dese in da kitchen cabinet..."
Love it!! You always nail those emotions on their faces!